Gran Canaria is one of the main tourist destinations in the Canary Islands thanks to its exceptional beaches and promise of a warm and dry climate all year round. Home to around 838,000 people, it is the second most populated isle in the archipelago after nearby Tenerife and, while it is located in the Atlantic Ocean close to Africa, it is undoubtedly a Spanish island. 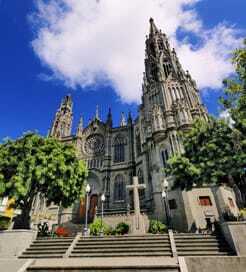 While it has a thriving business sector in its capital city Las Palmas, Gran Canaria's main industry is tourism, with British, German and Scandinavians making up the largest proportion of visitors. There are currently 2 direct routes from mainland Spain to Gran Canaria Island sailing from the southern Spanish ports of Cadiz and Huelva. Due to the distance between the mainland and the Canaries, crossings are not overly frequent and are generally long in duration. The ships used on these crossings are usually of a high standard though so a pleasant time at sea is likely. Most of the ferries arriving in Gran Canaria are travelling from the other Canary Islands with numerous routes offered from Lanzarote, Fuerteventura, La Palma and Tenerife. Gran Canaria's position between Tenerife and Fuerteventura naturally make those the easiest islands to get to and from. There are 2 active ferry ports in Gran Canaria. Las Palmas, the main port of arrival, can be found on the north east side of the island and is where the ferries sailing from Spain and the other islands arrive at. Puerto de las Nieves, the picturesque village port of Agaete is on the north west side of Gran Canaria and connects you with Tenerife. Gran Canaria's main attraction is its weather. During the summer months temperatures soar to the 80s Farenheit and even during the winter it is unusual for it to be any colder than the mid 60s F. This climate makes the island great for beach holidays, with families typically heading to the resorts in the south of Gran Canaria such as Maspalomas and Puerto Rico. Key attractions in Gran Canaria include the Palmitos Park Zoo, Aqualand Water Park and the Maspalomas sand dunes. For more information, please visit our Ferries from Lanzarote to Gran Canaria page. For more information, please visit our Ferries from Fuerteventura to Gran Canaria page. For more information, please visit our Ferries from La Palma to Gran Canaria page. 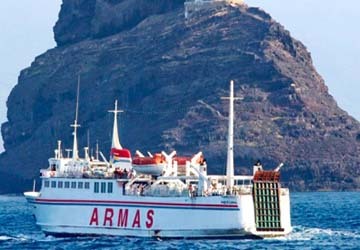 For more information, please visit our Ferries from Tenerife to Gran Canaria page.